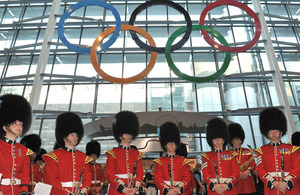 The Band of the Irish Guards along with the Welsh Guards' poster boy Garrison Sergeant Major William Mott helped to unveil giant Olympic Rings at Heathrow Airport yesterday which will greet visitors arriving in the UK. The aluminium rings, which measure 12 metres in width, have been installed in Terminal 5 at Heathrow, the host airport of this year’s Olympic Games, to greet two million passengers arriving in the UK via the airport. The rings were officially unveiled at a special event yesterday attended by Paul Deighton, London Organising Committee of the Olympic and Paralympic Games Chief Executive, Nick Cole, Head of Olympic and Paralympic Planning at Heathrow, and Mark Foster, one of the most successful British swimmers of all time. The Band of the Irish Guards provided musical accompaniment, playing military fanfares and well-known British tunes under a 30-foot (9m) portrait of Welsh Guards Garrison Sergeant Major William Mott. 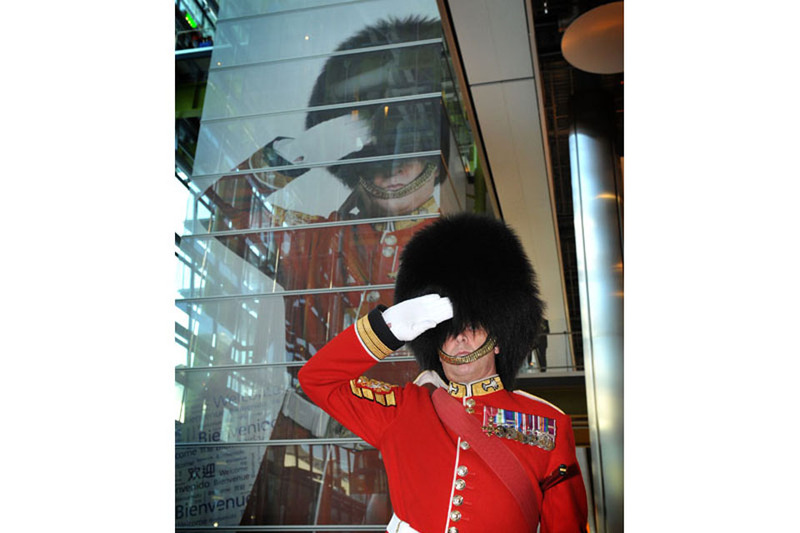 The huge picture shows Garrison Sergeant Major Mott dressed in the iconic Welsh Guards ceremonial red tunic and bearskin cap and is the first face that welcomes visitors to Heathrow. Garrison Sergeant Major Mott, the most senior Warrant Officer in the British Army, also in attendance at yesterday’s unveiling, was recently presented with an historic Warrant Officers’ badge, approved by Her Majesty The Queen. He was responsible for organising the lining of the processional route at last year’s Royal Wedding, which was made up of over 1,000 military personnel, as well as some of the most spectacular state ceremonial events over the last decade. During the Queen’s Diamond Jubilee Pageant on London’s River Thames, Garrison Sergeant Major Mott called the four-hundred-strong ‘Manpower Squadron’ rowing vessels to order as Her Majesty embarked on the Royal Barge ‘Spirit of Chartwell’. Barking out the ‘words of command’ devised specially for this unique occasion, Garrison Sergeant Major Mott called on all crews to cease rowing and raise their oars in a Royal Salute to Her Majesty. Garrison Sergeant Major Mott is also the voice of the 10-inch (25cm) infantry HM Armed Forces action figure. The Olympic Rings are one of the world’s most recognisable logos. The five rings - coloured blue, yellow, black, green and red - represent the union of the five continents and the meeting of athletes from throughout the world at the Olympic Games. I know first-hand the nervous excitement that every athlete feels when they arrive for the Olympic Games. The atmosphere is electric and often the airport is the first time we see fans and really feel the special buzz of the weeks to come. The rings will create a huge sense of excitement and be a great part of the welcome for everyone travelling though the terminal. Giant sets of Olympic Rings are being installed at iconic sites across the United Kingdom to excite and inspire people ahead of the Games and to demonstrate that we are ready to welcome the world. Ceremonial troops from all three Services will support the London 2012 Games as Olympic victory flag-raisers and in numerous other ceremonial roles. And more than 13,500 military personnel are standing by to help provide security and deliver a safe and successful Olympic Games, while several members of the Armed Forces will also be competing in the Games themselves.